Episode 77 - Drona is dead and a new commander is needed. Ashwatthaman proposes that Karna be given the position and everyone else agrees. Karna leads the army through a rather desultory day of fighting and then complains that what he is missing is a good driver. Shalya is drafted to be his charioteer. Shalya had promised to cause trouble should things come to this pass, and he lives up to it by constantly bickering with Karna. For some reason, Karna chooses this moment to confess how he deceived Rama Jamadagnya in order to obtain the Brahma weapon. 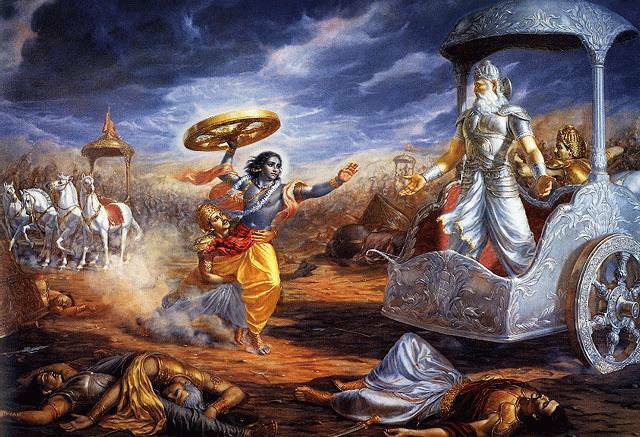 When Rama finds out Karna is just a Suta disguised as a Brahmin, he curses Karna.